Bel (/ˈbeɪl/; from Akkadian bēlu), signifying "lord" or "master", is a title rather than a genuine name, applied to various gods in the Mesopotamian religion of Akkad, Assyria and Babylonia. The feminine form is Belit 'Lady, Mistress'. Bel is represented in Greek as Belos and in Latin as Belus. Linguistically Bel is an East Semitic form cognate with Northwest Semitic Baal with the same meaning. Early translators of Akkadian believed that the ideogram for the god called in Sumerian Enlil was to be read as Bel in Akkadian. This is now known to be incorrect; but one finds Bel used in referring to Enlil in older translations and discussions. 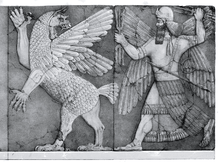 Bel became especially used of the Babylonian god Marduk and when found in Assyrian and neo-Babylonian personal names or mentioned in inscriptions in a Mesopotamian context it can usually be taken as referring to Marduk and no other god. Similarly Belit without some disambiguation mostly refers to Bel Marduk's spouse Sarpanit. However Marduk's mother, the Sumerian goddess called Ninhursag, Damkina, Ninmah and other names in Sumerian, was often known as Belit-ili 'Lady of the Gods' in Akkadian. Of course other gods called "Lord" could be and sometimes were identified totally or in part with Bel Marduk. The god Malak-bel of Palmyra is an example, though in the later period from which most of our information comes he seems to have become very much a sun god. Similarly Zeus Belus mentioned by Sanchuniathon as born to Cronus/El in Peraea is certainly most unlikely to be Marduk. Bel was believed to be a patriarch from Armenia, somehow related to Hayk (the supreme God for ancient armenians) - the story tells they were brothers, but they may probably have been cousins. According to the myth, Hayk and Bel were both patriarchs of their own tribes, competing for supremacy. Hayk beat Bel, so the latter chose to go south to Babylon, and established himself there, became powerful again and lead his forces to avenge his previous defeat against Hayk. Somewhere near Van, the ancient capital of urartian Armenia, a final battle took place between the siblings. Hayk beat Bel with an arrow, and thus became the sole leader. He unified the tribes, that altogether took the name Armenia (in armenian, Hayastan, after Hayk). 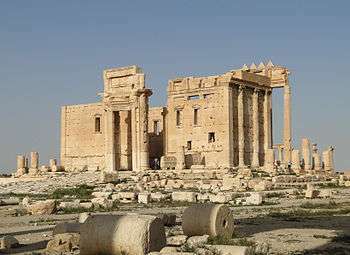 Temple of Bel in Palmyra was destroyed by ISIS militants in 2015. Wikimedia Commons has media related to Baal.